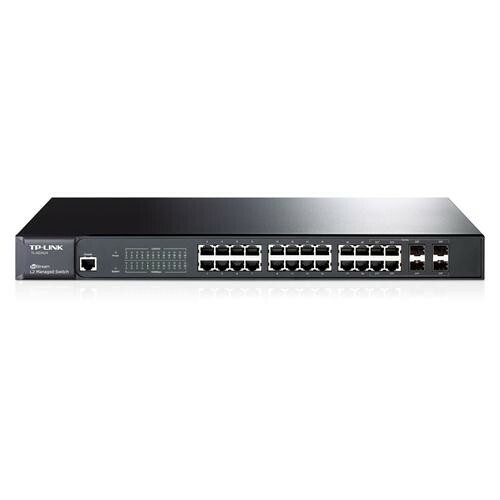 TP-LINK JetStream gigabit L2 managed switch TL-SG3424 provides 24 10/100/1000Mbps ports. The switch provides high performance, enterprise-level QoS, advanced security strategies and rich layer 2 management features. Moreover, the switch also comes equipped with 4 combo SFP slots, expanding your network flexibly. This JetStream gigabit L2 managed switch is cost-effective for the ideal small and medium business solution. TL-SG3424 have robust security and management features. The IP-MAC-Port-VID Binding and Access Control List (ACL) functions protect against broadcast storm, ARP and Denial-of-Service (DoS) attacks, etc. Quality of Service (QoS, L2 to L4) provides enhanced traffic management capabilities to move your data smoother and faster. Anymore, the easy-to-use web management interfaces, along with CLI, SNMP and RMON, mean faster setup and configuration with less downtime. For workgroup and departments requiring cost-sensitive Layer 2 Switch and gigabit capability, TP-LINK JetStream L2 managed Switch TL-SG3424 provides you the ideal access-edge solution. •	Microsoft Windows 98SE, NT, 2000, XP, Vista or Windows 7, MAC OS, NetWare, UNIX or Linux.